This chapter presents new models of comprehension that we have been develop­ ing in recent years. 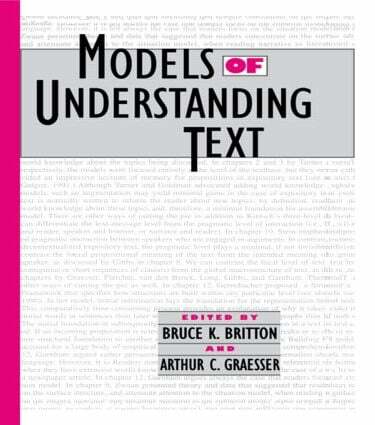 These models focus on deeper levels of comprehension (which involve pragmatics, inferences, and world knowledge) rather than shallow levels of comprehension (such as lexical processing, syntactic parsing, and the interpre­ tation of explicit text). Early research in the psychology of language and discourse processing emphasized the shallow levels of comprehension. It was easier to measure and manipulate factors directly associated with the surface text than to struggle with barely visible mechanisms at the deep levels. There were many theories about the surface levels, enough theories to occupy everyone’s time for several decades. However, researchers came to recognize the pressing need to explore the deep levels. They discovered that the deep levels often have a greater impact on reading time, memory, decision making, and judgment than do the shallow levels. They also identified interesting ways in which deep levels inter­ acted with shallow levels of processing. The Zeitgeist has shifted from the shallow to the deep levels of comprehension.